As the First World War staggered towards its bloody conclusion 100 years ago this month leaving 17 million dead, the war-worn world suffered a second catastrophe. A lethal influenza pandemic swept the planet killing at least 50 million people. Most towns in the UK have fitting memorials to the war dead but the many who died from influenza are neither commemorated nor remembered. The Spanish flu, as it came to be called, was the greatest global killer since the Black Death. It is very important that its victims should not be forgotten and lessons learnt for dealing with future pandemics. 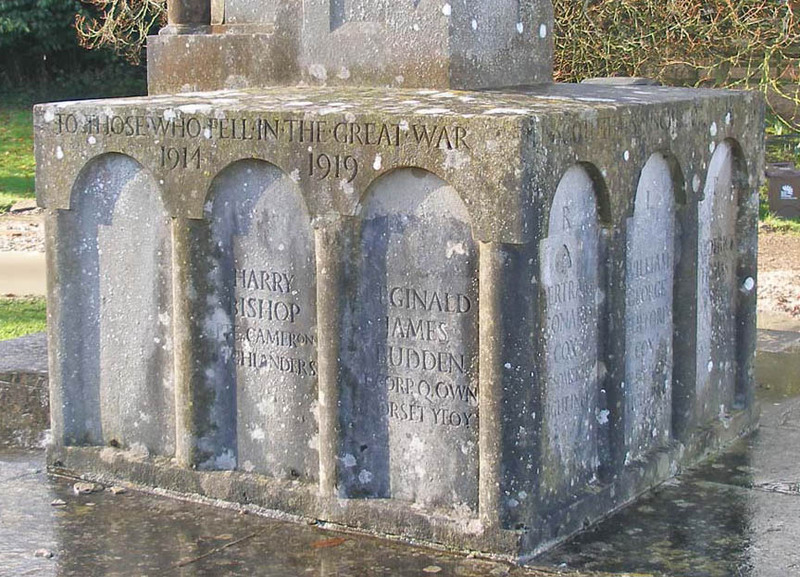 Detail of the war memorial in the tiny Dorset hamlet of Briantspuddle showing some of the names and regiments of the war dead. Even from somewhere as small as Briantspuddle seven men were killed in WW1 and six in WW2. By June 1918, the fighting had been raging for nearly four years. Already worn down by the privations of war and the deaths of so many young men, people in the UK began to suffer the symptoms of influenza. Sore throat, headache and fever were typical but, after a few days in bed, people recovered and got on with life as best as they could. The illness had already swept across the US in the spring, reaching the trenches of the Western Front by mid-April leading to a brief lull in the fighting while troops recovered. By September, however, a second wave of influenza surfaced, now in a deadly new guise. The virus was highly infectious sweeping through populations and quickly reaching most countries around the globe, its lethal progress assisted by the movement of troops to and from war zones. The majority experienced typical flu symptoms, perhaps a little more severe, and recovered quickly but, for about one in twenty of those infected, the effects were much more serious. Pneumonia-like symptoms caused by bacterial infection of the lungs were common leading to breathing problems and copious bloody sputum. Sometimes, the face and hands developed a purple-blue colouration suggesting oxygen starvation. This colour might spread to the rest of the body, occasionally turning black before sufferers died. Post mortem examination revealed lungs that were red, swollen and bloody and covered in watery pink liquid; victims had effectively drowned in their own bodily fluids. There were no effective treatments, antibiotics had not been developed, and the death rate was high. By Christmas the second influenza wave had burnt itself out only for a third wave of intermediate severity to strike in the first few months of 1919. 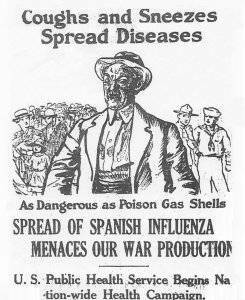 The pandemic came to be called “Spanish flu” because Spain alone, not being part of the war and so not subject to censorship, reported its flu experience freely. In the UK, the Spanish flu killed 228,000 people in the space of about six months but this was a global pandemic and around the world the mortality was staggering. There were 675,000 deaths in the US and up to 17 million in India; overall the illness killed at least 3% of the entire population of the world. Unlike typical seasonal flu epidemics, deaths from Spanish flu were highest among 20-40-year olds with pregnant women being particularly vulnerable. If World War 1 had consumed the flower of youth, Spanish flu cut down those in their prime. The sudden, widespread occurrence of a major illness with such high mortality caused huge disruption to daily life in the UK, especially in large towns. Medical services were overwhelmed as many doctors and nurses were on war service, funeral directors were unable to cope and there were reports of bodies piling up in mortuaries. The response of the medical authorities was poor, underplaying the gravity of the situation and providing little guidance; the newspapers, wearied by war news, were reluctant to give this new killer much coverage. Understanding of disease in the general population was rudimentary and a sense of fear and dread prevailed as people witnessed so many apparently random deaths. Here are two extracts from letters written to the author Richard Collier by people alive in 1918 describing their experience of the pandemic. These were kindly given to me by Hannah Mawdsley. 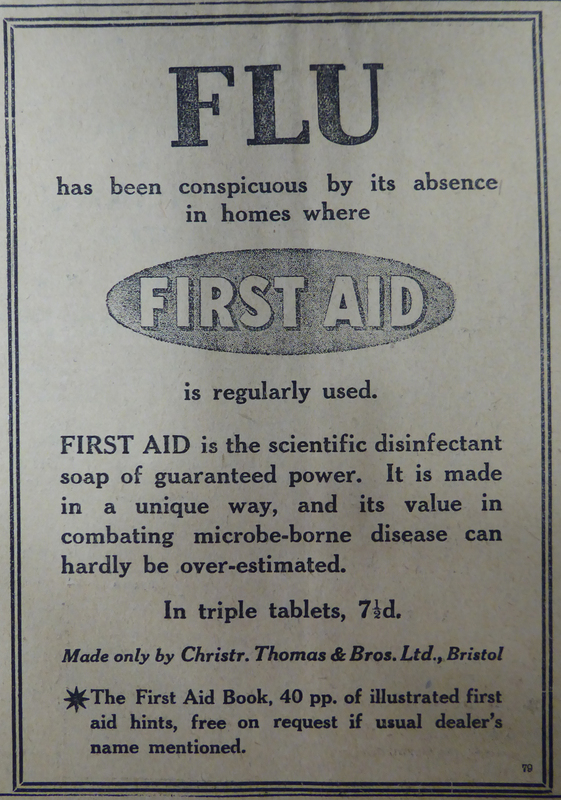 This advertisement appeared in the Totnes Times in November 1918. There were no treatments for Spanish flu but claims for cures abounded at the time. This is one of the milder ones. Given the high mortality and the disruption to normal society I find it surprising that the pandemic was not commemorated and seems to have been forgotten quickly. Perhaps after four long years of carnage abroad and disruption at home, another horror was just too much, and the only way to cope was to forget? But what was it about the 1918 flu virus that made it so virulent producing symptoms unlike any seen before and killing so many people? We still don’t know but scientists in the US have made some headway by studying the virus extracted from corpses of people who died during the second wave of the infection preserved in Alaskan permafrost. This showed, surprisingly, that the 1918 virus had a structure similar to a bird flu virus. This partly accounts for its virulence: its bird flu-like structure would have been alien to the immune system of people at the time. Because it also had the ability to infect human cells, it was a lethal vector of disease causing, in some patients, severe damage to the lining of the respiratory tract leading to bacterial infection and pneumonia, engorged lung tissue and bloody sputum. A flu virus normally found in wild birds had acquired the ability to infect humans and the pandemic was the result. Could history repeat itself? 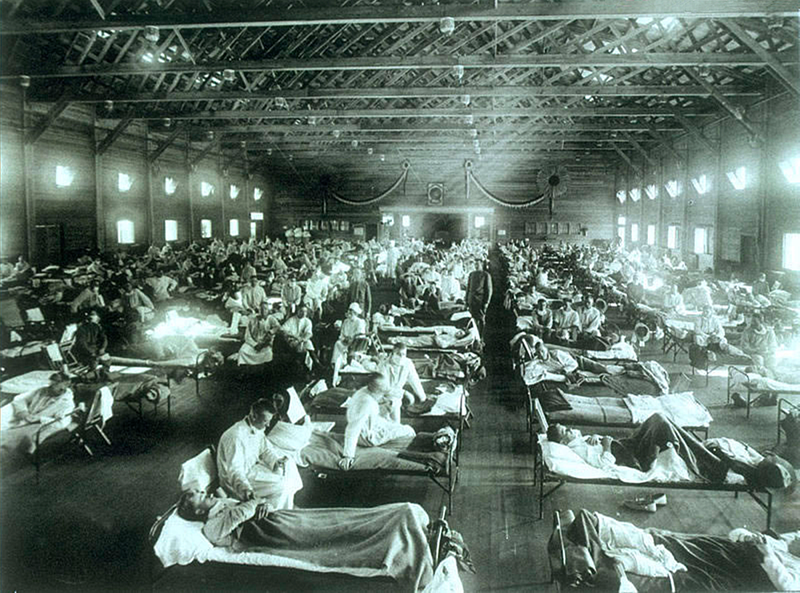 Could the world experience another lethal influenza pandemic? There is certainly concern among experts that this could happen and the Government recognises pandemic influenza as “one of the most severe natural challenges likely to affect the UK”. Current concern is focussed on two bird Influenza viruses circulating in the Far East. Since 2003, these have infected more than 2000 people and nearly half have died. Almost all the human infections have come from close contact with poultry or ducks but should one of these viruses change so that person to person transmission becomes possible, then we could be facing another major pandemic. How would we react? Our health care systems, at least in the developed world, are more sophisticated compared to 1918 and surveillance is better so that we should have early warning of the start of a pandemic. The UK Government has an Influenza Pandemic Preparedness Strategy, we have antibiotics and vaccines to combat bacterial pneumonia and some antiviral drugs to reduce flu symptoms. There is still the likelihood that health care systems would be overloaded and perhaps our best long-term hope is the development of a universal flu vaccine to protect against all strains of the virus. This article appeared in a slightly modified form in the November 2018 edition of the Marshwood Vale Magazine. The picture at the head of this post shows a group of women in Brisbane, Australia wearing masks as a protection against Spanish flu (from Wikimedia Commons). I should like to thank Hannah Mawdsley for giving me the two letters from people remembering the flu pandemic. Back in June, I went on a walk across some flower-rich chalk grassland in west Dorset (a county in the south west of the UK). The article below describes the walk and was published in the September edition of the Marshwood Vale Magazine. It is a very “Dorset” article and some readers may not be familiar with a few of the allusions. So, the Cerne Giant (or the Rude Man of Cerne) is a massive figure carved in the grass upon a chalk hillside above the village of Cerne Abbas. Gabriel Oak is a sheep farmer who features strongly in Thomas Hardy’s novel “Far from the Madding Crowd”, immortalised, for me, in the 1967 film starring Alan Bates, Julie Christie, Terence Stamp and Peter Finch. Gabriel Oak keeps his sheep on a chalk grassland hillside. A “coombe” is a local name for a valley. 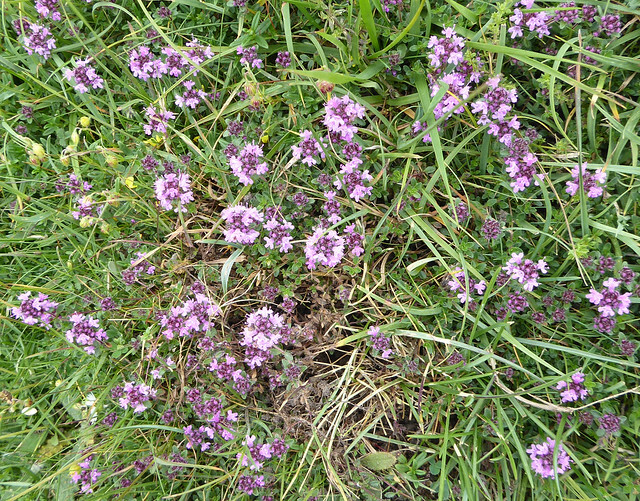 Some of the species found on the chalk grassland including wild thyme (purple), black medic (yellow) and salad burnet (dry brown). 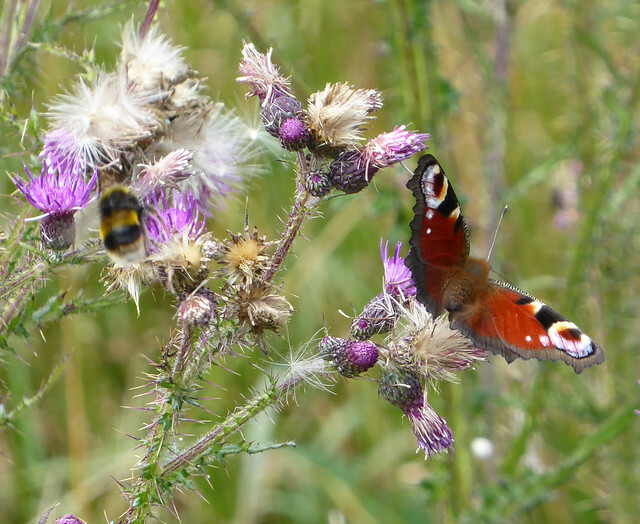 Chalk grassland with its colourful wildflowers and multitude of insects was once a common sight in a Dorset summer. It is the landscape defended by the Cerne Giant and where, in Far from the Madding Crowd, we first meet sheep farmer Gabriel Oak. In the 20th century, however, much of Dorset’s chalk grassland disappeared following changes in farming practice, although small areas survived, usually where ploughing was too difficult. So, when I heard about the visit to Higher Coombe, an area of chalk grassland above Litton Cheney, as part of the South Dorset Ridgeway Festival of Discovery, I jumped at the chance to see this ancient landscape and its exuberant floral displays. We gathered near the entrance to Coombe Farm just off the busy A35. Despite this being only a few days away from the summer solstice, the sky was overcast and a cold, blustery wind cut across the ridge sending many of us to grab warmer clothing. The coombe fell away to the south, a deep gash in the chalk with precipitous grassy sides and extra folds and creases giving the landscape the look of a rumpled duvet. A farm track clung to the eastern side of the coombe and higher up, near Coombe Coppice, sheep dotted the hillside. Beyond the coombe, occasional shafts of sunlight illuminated the Bride Valley and its patchwork of green fields. The sea should have been visible but a distant mist had taken its place. Local expert Nick Gray, from the Dorset Wildlife Trust, was our guide for the afternoon. He began by shepherding us through a farm gate on to the western slope of Higher Coombe to follow a rough contour along the hillside. Walking was difficult, there was no distinct path in the long, thick grass and the steepness of the hillside made it awkward to pause to observe. But there was plenty to see: architectural clumps of thistles with their purple mop heads, many different species of grasses and, where the turf became shorter, a mosaic of colourful wild flowers lighting up the hillside. 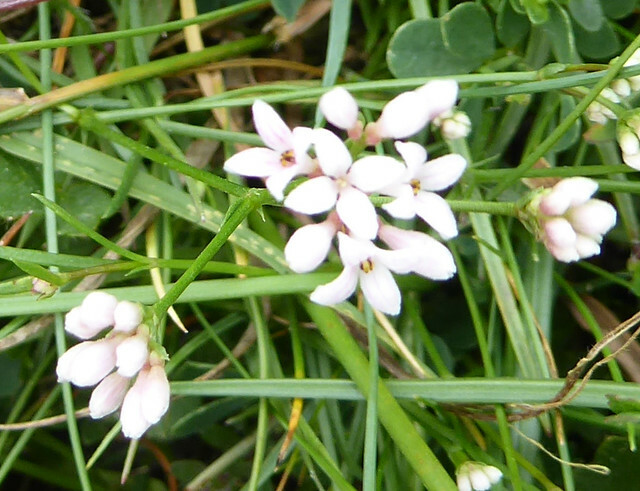 My attention was drawn by the violet-purple splashes of wild thyme with its distinctive tubular flowers but Nick made sure we also noticed the tiny white trumpet flowers of squinancywort with their delicate pink stripes. The buttery yellow flowers of bird’s foot trefoil were also scattered about the hillside together with frothy lemon-yellow clumps of lady’s bedstraw and the delicate golden globes of black medic. A few lilac-mauve discs of scabious and pink-purple pyramidal orchids added to the display. 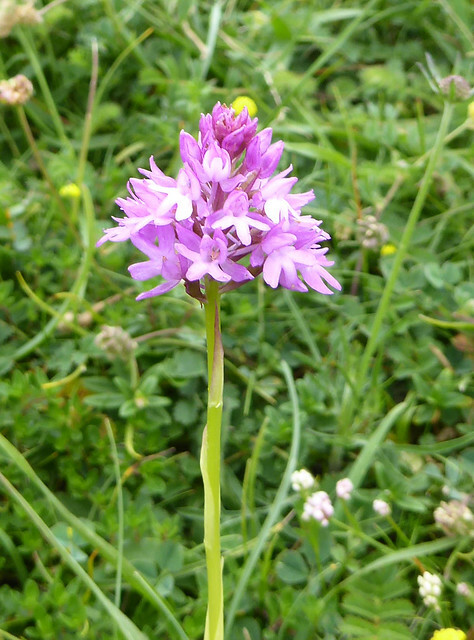 These were just a few of the diverse plants growing here and it has been estimated that chalk grassland can support up to 40 different species of flowering plant per square metre. It is one of Europe’s most diverse habitats, the European equivalent of the tropical rain forest. 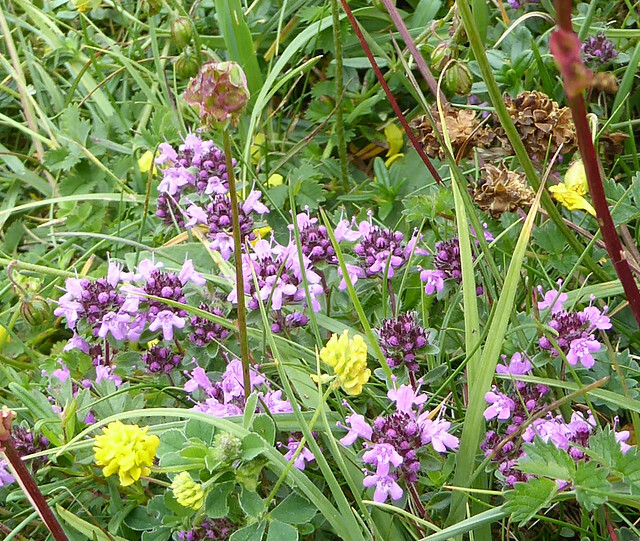 So, why is chalk grassland such a rich habitat? 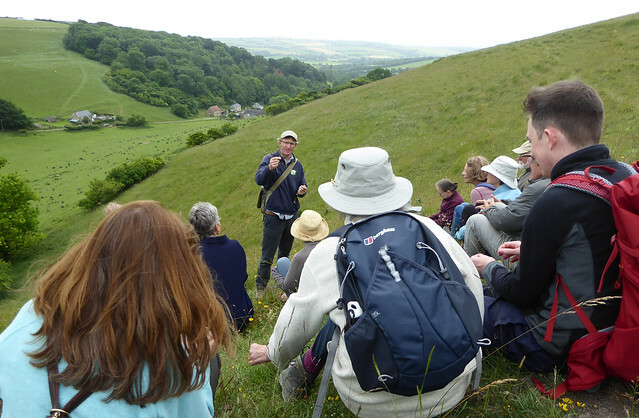 The soil that covers the underlying chalk hills is a great influence, as Nick explained to us. Thin, lime rich and nutrient poor, it holds little water especially on steep slopes and dries out quickly in the summer. These stressed conditions mean that lush grasses cannot dominate and a wide range of chalk loving species can flourish. Good management with controlled grazing is also essential to keep the turf short, stop scrub developing and at the same time allow chalk grassland plants to grow. The land on both sides of Higher Coombe is managed through a stewardship agreement with the farmer whereby, for about six months each year, grazing animals are excluded on one side. When grazing stops, the grassland explodes into flower and this year the western side is getting its chance. Next summer it will be the turn of the eastern side which will be ablaze with orchids. With this profusion of flowers, I had expected to see many invertebrates but, that afternoon, there were very few flying. Bees in particular were scarce and we saw only two bumblebees all afternoon. Perhaps the cool air, the lack of sunshine and the encroaching sea mist were restricting their activity? We came across two large golden-ringed dragonflies resting among the vegetation on the hillside, unable to fly in these weather conditions. This did, however, give us the chance to examine these normally mobile creatures with their striking yellow bands on a black background. Later on, as we walked through another field on the eastern side of the coombe, we disturbed many small butterflies which seemed to be sheltering in the long grass. 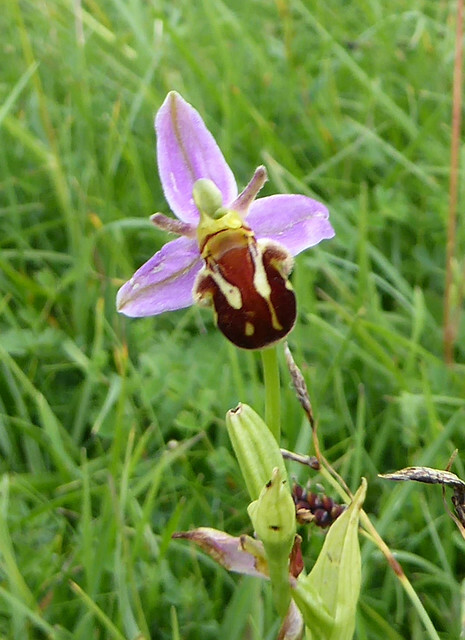 In part compensation for the lack of flying insects, there were some beautiful bee orchids and common spotted orchids on this second chalk hillside. But should we care about the decline of this special and once common habitat? 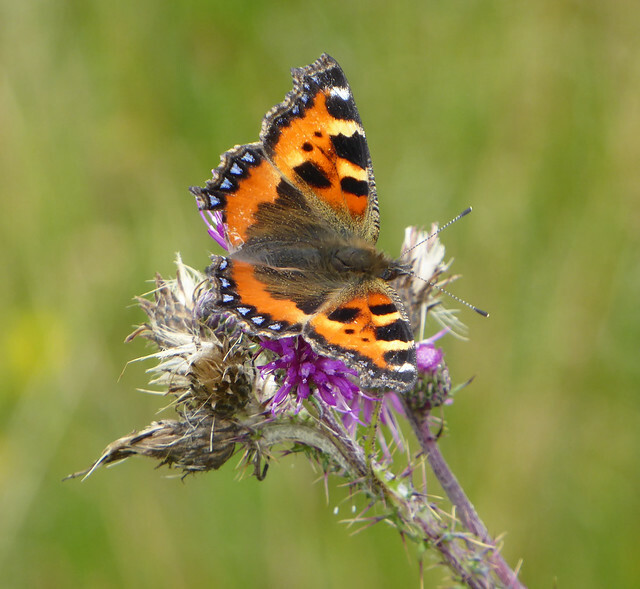 The loss of wild flowers will certainly have affected the beauty of our countryside, as well as contributing to the well-documented decline in insects and farmland birds. There is also evidence that florally-rich chalk grassland provides healthier forage for grazing animals as compared to contemporary feeding on heavily fertilised rye grass. Perhaps, had we been aware of the importance of the chalk grassland landscape, we might have valued it more? If you want to see some of the remaining pockets of this special landscape then try Eggardon Hill or Maiden Castle or the Cerne and Sydling Downs or, further afield, visit Ballard Down in the Purbecks or Hambledon Hill and Hod Hill north of Blandford. Chalk grassland is glorious at any time of year but the best time for flowers is from spring until early autumn. Nick Gray talks to the group on Higher Coombe with the Bride Valley in the distance. 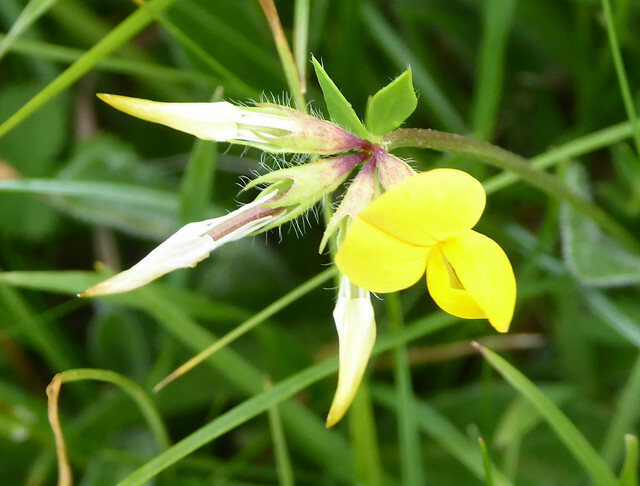 One flower and three seed heads of bird’s foot trefoil. The shape of the seed heads is responsible for the “bird’s foot” part of the name and also for one of the plant’s local names, granny’s toenails. It was a luminous spring morning in early May when I trekked up Hardown Hill in west Dorset in the south west of the UK. 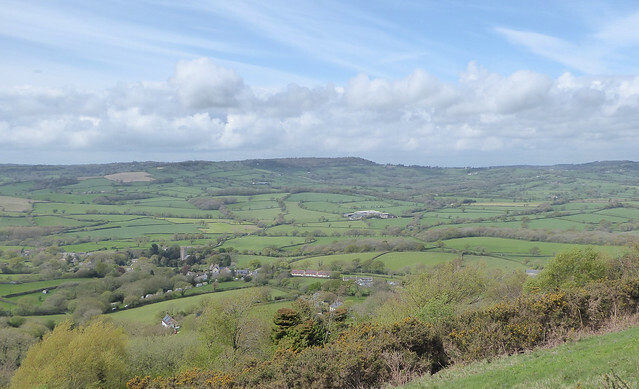 Hardown rises steeply above Morcombelake and the surrounding countryside affording fine views of the coast and of the Marshwood Vale. Compared with its well-known cousin, Golden Cap, across the valley (see picture above), this flat-topped hill is unjustly ignored but its heathland summit boasts a rich ecology supporting several rare species and, for many years, Hardown Hill was a busy semi-industrial site where building stone was mined. 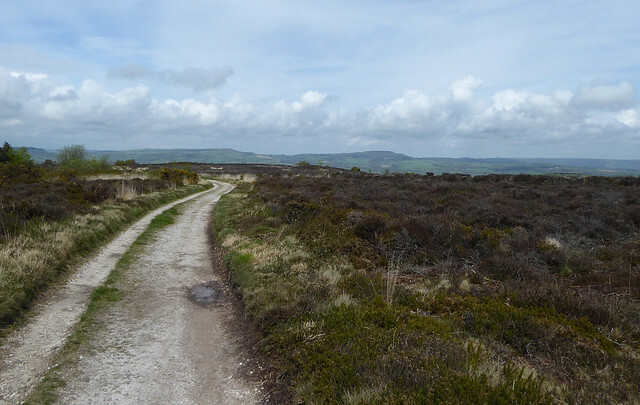 It’s a steep climb to the top of Hardown Hill but finally the stony track flattens out and I enter a heathland landscape, rare in this part of Dorset. 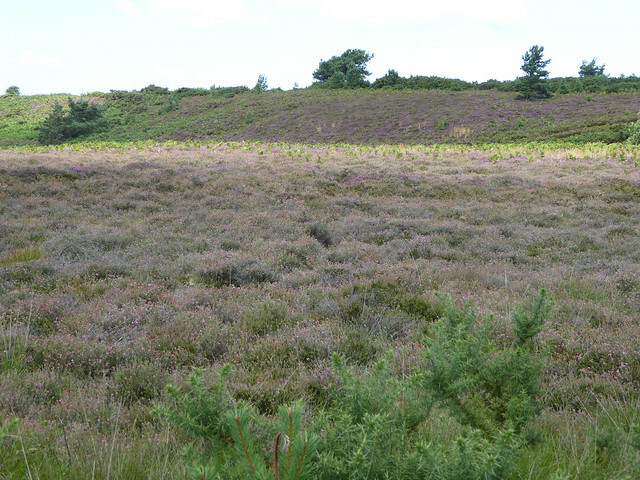 The summit is broad and flat and typical low-growing heathland plants such as gorse and several species of heather flourish here on the acid soil. Pale sandy tracks cut swathes across the heath but, even on a sunny morning in springtime, the feeling is sombre, dominated by dark browns and greens. A few mature birch trees and a small copse of pine trees provide relief and I come across a pond surrounded by tall clumps of pale, dried grass and a struggling sallow. This heath habitat is also the home of rare nightjars, sand lizards and Dartford warblers. Standing on the Hardown summit is an elemental experience. Today, a moderate wind blows from the west, rising and falling like the sound of surf on the strand. The heath vegetation rustles and fidgets in response, accompanied by skylarks trilling high overhead. I watch a spirited storm tracking across Lyme Bay and prepare to shelter but, in the end, it mostly avoids the land leaving the sun to return. All of this is overlaid on the southern side by the ebb and flow of traffic noise from the busy A35 some distance below. The heath may look uninviting and barren, but this is springtime and there are many signs of renewal. A few clumps of yellow gorse stand out above fresh grey-green growth and heathers push feathery green and red shoots upwards. 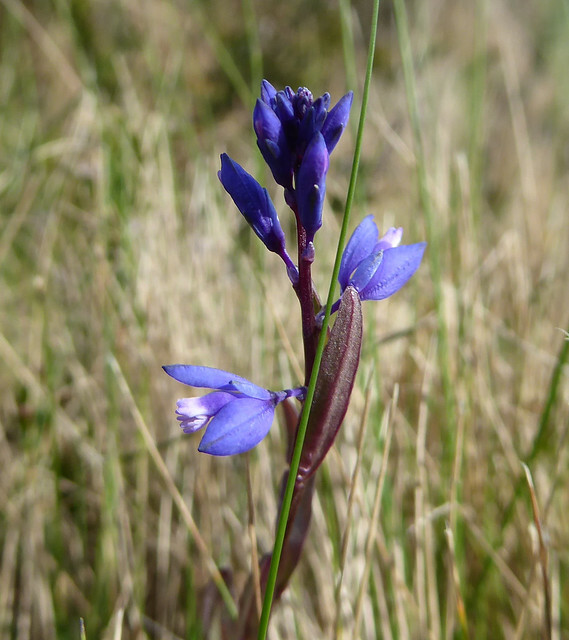 Submerged in the thick heath vegetation are the small bright blue and white flowers of heath milkwort piercing the darkness like stars in the night sky. 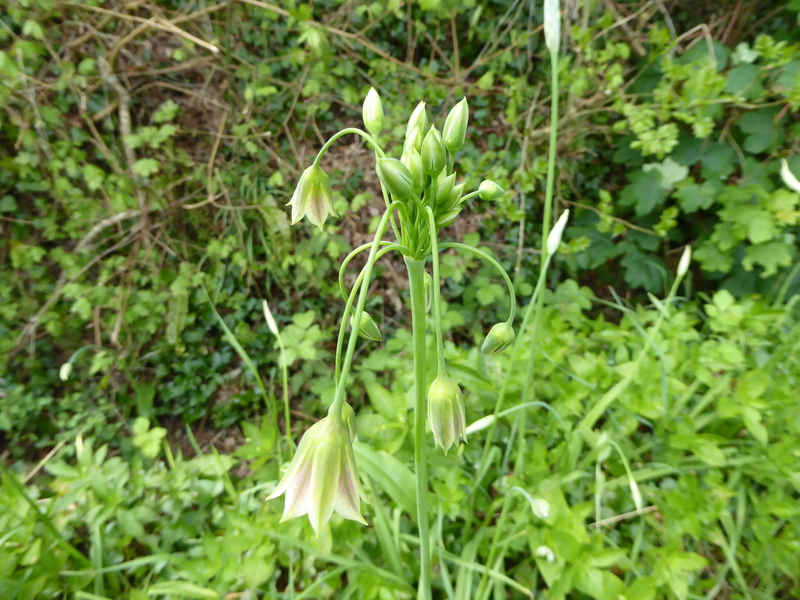 In the past, the flowers were thought to resemble small udders and this may account for the plant’s name as well as its administration to nursing mothers by medieval herbalists. Along path edges on the northern side of the heath, I find several generous clumps of a shrub with pale fleshy leaves, green with a tinge of pink. 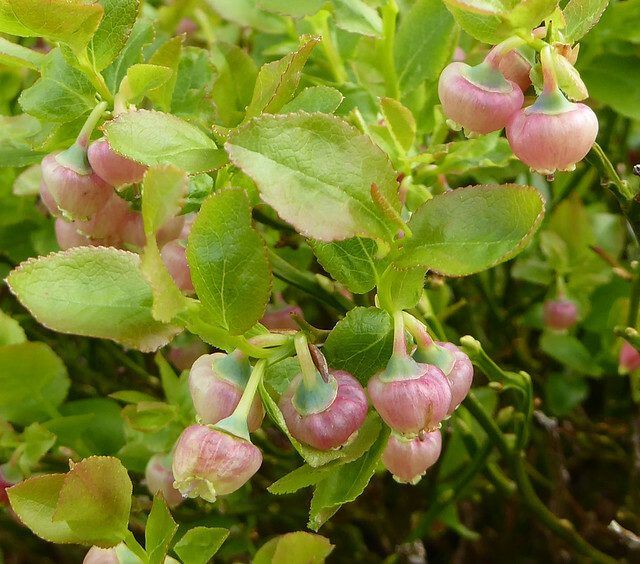 This is bilberry, covered at this time of year with delicate, almost transparent, pale red, lantern-shaped flowers looking out of place in this harsh environment but proving popular with bumblebees and hoverflies. Late summer will see the plants covered with succulent black fruits. I encounter only one other person on the heath but it hasn’t always been such a quiet place. From medieval times, Hardown Hill would have resounded to the clash of picks and shovels wielded by men mining the landscape for building materials. Beneath the thin layer of soil that covers the summit, there are layers of clay and a yellow/brown sandy material containing substantial lumps of flint-like, hard rock, the chert cobs. 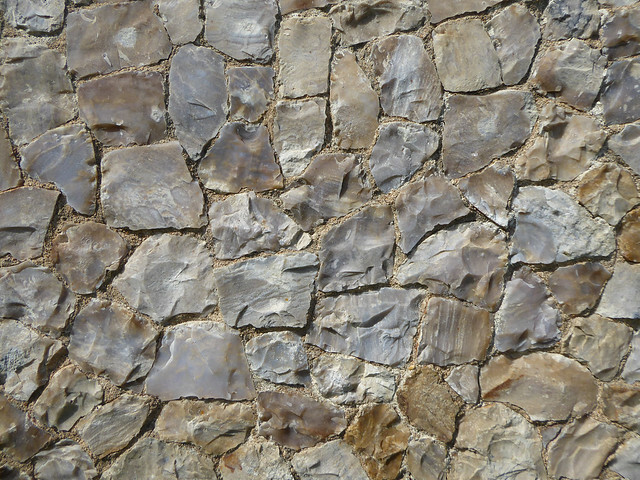 A mixture of clay, stone and sand was taken for road construction and the chert cobs were used for building. Mining occurred on the southern slopes of the Hill, either in open pits or in adits (mine shafts) cut into the hillside. Nowadays there are few traces of this busy activity. The mining area has mostly been colonised by rough grass and bracken, brightened today by a haze of bluebells. 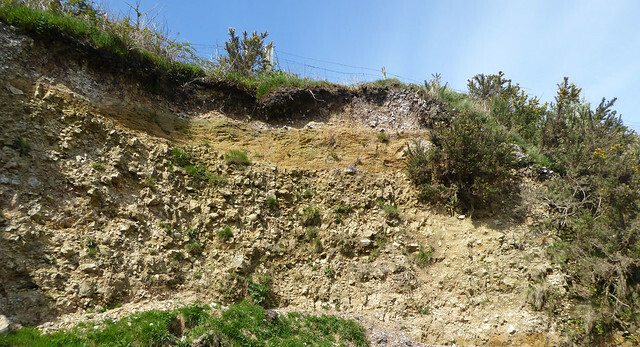 One open pit has been preserved near the top of Love’s Lane displaying the layers of rock and the chert cobs. The adits are inaccessible for safety reasons but one serves an important role as a hibernation area for the rare lesser horseshoe bat. The chert cobs were split using a small hammer on a long handle, the Hardown hammer. Cobs were held on an iron bar with three claws and covered in damp hessian to protect the eyes of workmen who also wore wire goggles. Split cobs were used to provide a tough outer surface, silvery-blue or yellowish, on domestic and farm buildings around the Marshwood Vale. Good examples of the use of Hardown chert can also be found on the 14th century abandoned chapel at Stanton St Gabriel beneath Golden Cap and on the tiny 19th century church at Catherston Leweston. But it is to the height of Hardown Hill that I want to return. Its prominence above the surrounding countryside gives spectacular views with new perspectives on some of west Dorset’s notable landmarks. 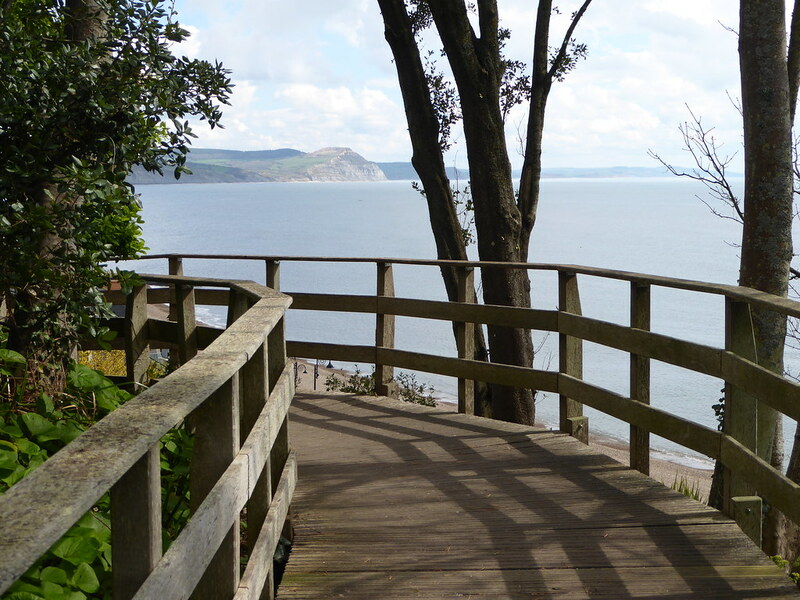 Looking southwards, we see Golden Cap and the darkly-wooded Langdon Hill rising steeply across the valley with a backdrop of the waters of Lyme Bay (see picture at the top of this post). Towards the east, Portland floats unsettlingly as if cast adrift. To the north, especially from Hardown’s rough grassy flanks, we look across the patchwork of fields and the ring of hills that make up the Marshwood Vale with the village of Whitchurch Canonicorum cradled in its green embrace. New perspectives challenge us to think differently and the relative isolation of Hardown fosters quiet contemplation away from the cares of everyday life. This piece was originally publsihed in the July 2018 edition of the Marshwood Vale Magazine. Towards the end of October, I spent a day at Cogden Beach, just east of Burton Bradstock in west Dorset. 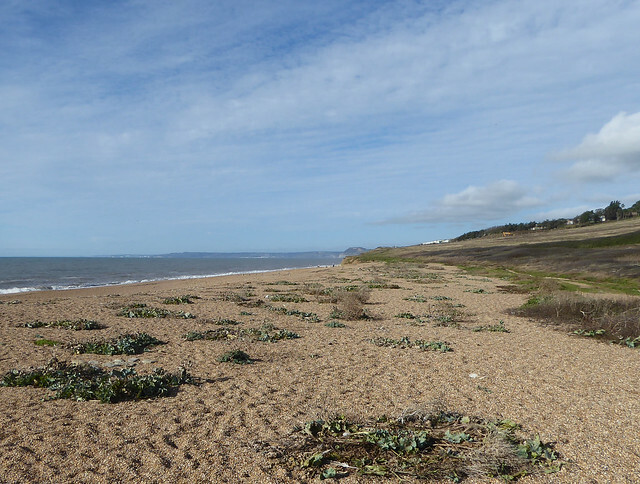 It’s a beautiful, natural spot, a rich concoction of sea, sky and shingle where wildlife prospers despite the sometimes harsh conditions. It’s becoming increasingly difficult, however, to ignore the scatter of plastic pollution on the beach and the potential effects of this manmade material on marine life. It felt unseasonably warm as I walked downhill from the car park, more like a late summer’s day, although the blood-red rose hips and smoky-black sloes decorating the leafless scrub spoke of a different season. The vast shingle bank of Chesil Beach dominated the long view, a yellowish-brown convexity edged with white waves sweeping eastwards towards a mistily mysterious Isle of Portland. The sea was calm and a steely grey except where the low sun’s rays highlighted individual wavelets whose reflections merged in to a broad, silvery band of light. When I reached the shingle bank I found traces of the special beach plants that grow so profusely here in spring and summer. Well weathered, blue-green and brownish-grey leaves were all that remained of the sea kale that dominates in May whereas, beneath the brown remnants of this season’s vegetation, fresh glaucous leaves were showing from the yellow horned-poppies. Small flocks of starlings skittered about puddles at the back of the beach like children in a school playground and, in a low sandy cliff, I was surprised to find bees busily filling nests. 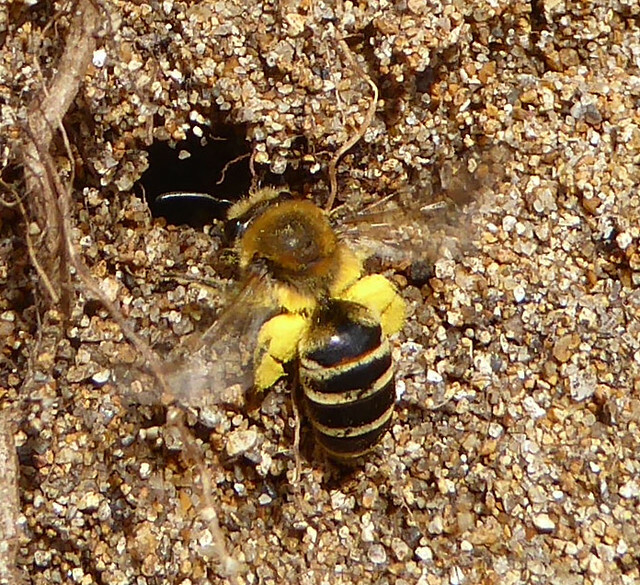 These were ivy bees (Colletes hederae), the last of our solitary bees to emerge, the females collecting chrome-yellow pollen from nearby clumps of flowering ivy. To the west, there were spectacular views of Burton Bradstock’s yellow cliffs and the distinctive flat top of Golden Cap. It seemed like the perfect natural spot. But was it? Almost all the clumps of beach plants contained plastic waste including pieces of plastic wrap, colourful plastic rope or plastic fishing line. 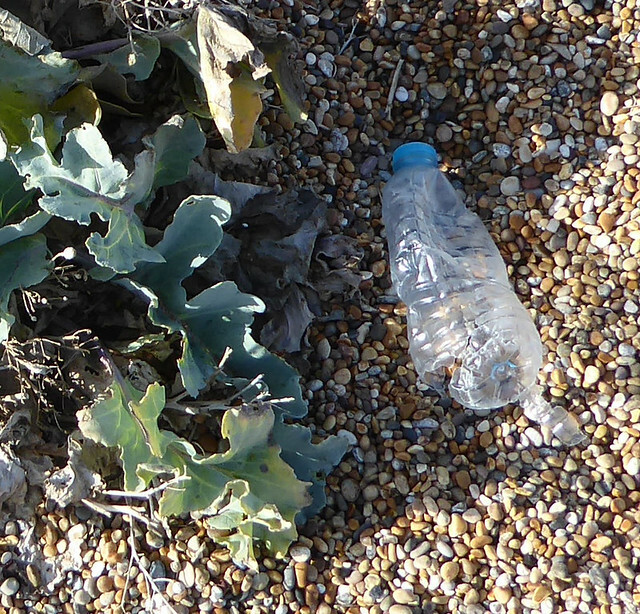 On the shingle between the clumps, I saw the occasional plastic drink bottle, some were intact, some in pieces. The prominent strandline about half way up the beach contained dark, dry seaweed and small pieces of wood mixed liberally with shards of plastic as though objects had shattered in their continual buffeting by the sea. 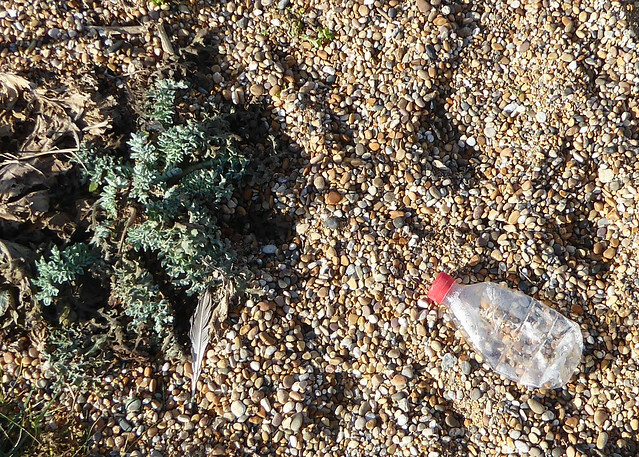 Plastic drink bottles or their fragments also appeared at regular intervals along the strandline. This beach is no longer a completely natural, wild place, it has been contaminated by our throwaway plastic culture. 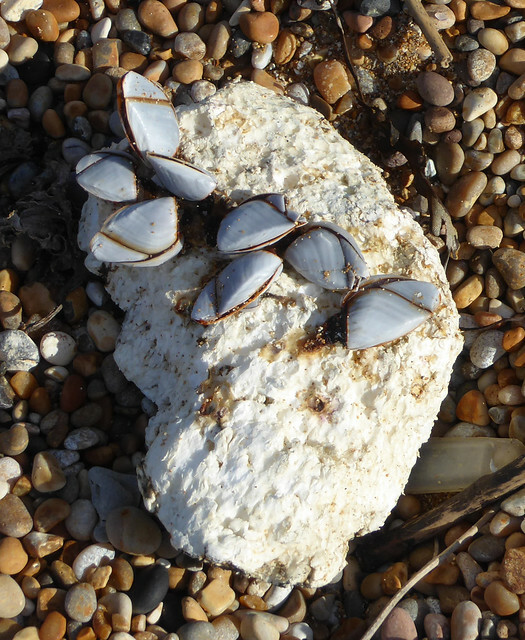 Perhaps the most poignant symbol of this tension was a chunk of expanded polystyrene covered with pale grey goose barnacles. Plastic is, of course, both versatile and cheap. It has transformed our lives but its very ubiquity and ease of use means that we don’t value it enough. Think how much you throw away each week: plastic wrap or bags from supermarket produce, drink containers and lids, plastic trays, pots and so on. We have embraced a “disposable” lifestyle where about half of the plastic we produce is used once and thrown away. Some countries manage to recycle or energy-recover a large proportion of their plastic waste but the UK is not one of them. In this country, more than 60% of plastic waste ends up in landfill where it does not break down and is effectively lost. We are squandering resources and energy on a massive scale, an appalling indictment of our way of life. 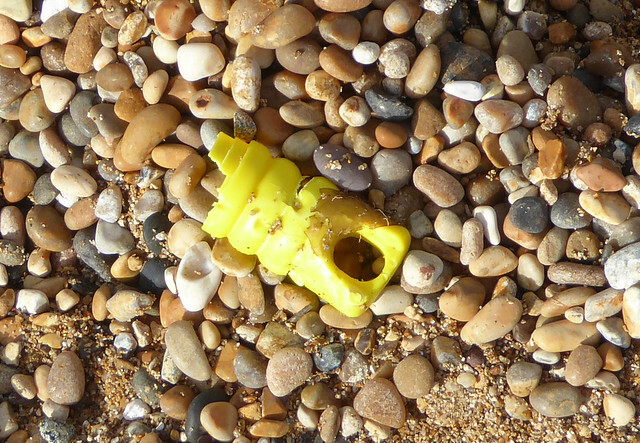 But what about the plastic waste I found on Cogden Beach, how does it get there? It comes from the sea and is left behind by the retreating tide. We have turned our oceans into a “plastic soup” composed of plastic bottles and bags, plastic fragments formed by breakdown of these larger items, also microplastics (5 mm or less in size) such as industrial pellets, small fragments and very small fibres from clothing or from car tyres. This is a huge global problem and shows no sign of abating. A staggering 12 million tons of plastic waste enters the oceans each year. All countries contribute but a large proportion comes from several in the Far East with poor waste management systems. The consequences for marine wildlife are alarming. Consider, for example, the Northern Fulmar, a bird that forages exclusively at sea. A study in the North Atlantic showed that 91% of dead Fulmars found on beaches had plastic in their gut, having mistaken the plastic for food, reducing their ability to feed and sometimes damaging their digestive tract. At the other end of the food chain, zooplankton have been shown to ingest tiny microplastic fragments that may end up in fish and perhaps in humans. 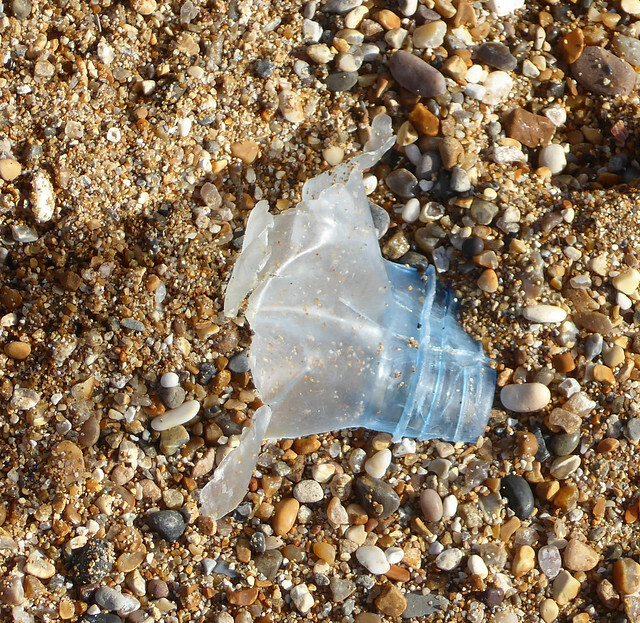 Plastic fragments also attract toxic chemicals that may affect the creatures consuming them. Our throwaway lifestyle is disturbing the entire global marine ecosystem. The problem is just as serious as climate change. What can be done? First, we must reduce the amount of plastic in circulation by moving away from single-use items such as plastic bottles, takeaway cups, plastic cutlery, plastic wrap and plastic packaging. The introduction of the 5p charge on plastic bags led to an 85% reduction in use, so a levy on single-use takeaway cups and plastic cutlery may also be effective. Second, we need to encourage a “circular economy” where as much plastic as possible is recovered and recycled and none goes to landfill. A deposit return scheme for plastic drink bottles would increase recovery but greater recycling of other plastic containers must also be achieved. It is encouraging that some government ministers are now talking about the problems of plastic waste, but their words must be translated into actions. Individual decisions can also bring about change. We can refuse to use plastic cutlery. We can choose to drink only from reusable cups. We can use and reuse our own shopping bag. We can recycle all plastic bottles and containers. We can pressurise local businesses to reduce plastic waste. We can participate in beach cleans. If we love our beaches and our seas we must do this. This article appeared in the January 2018 edition of the Marshwood Vale Magazine. Mistaken marriages, passionate affairs, tragic deaths, richly interwoven with folklore and superstition. This is the complex concoction contained in The Return of the Native, one of Thomas Hardy’s great novels. Hardy set his narrative on the semi-fictional Egdon Heath, a “vast tract of unenclosed wild” that assumes a claustrophobic, controlling influence on his characters. Hardy’s Egdon Heath has many of the features of the heath landscape that once filled the space between Dorchester and Bournemouth. 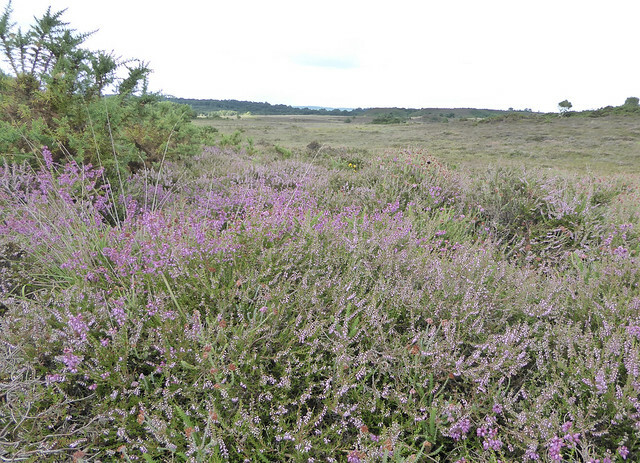 I wanted to experience Egdon so, on a warm, humid day towards the end of July, I went to Winfrith Heath one of the surviving fragments of this Dorset heathland. I followed a sandy soil track on to the heath, descending gradually between borders of gorse and low trees. As I gained distance from the road, long views opened up across the gently undulating terrain surrounding me and an eerie quiet descended, broken only by trains passing on the heath-edge line. Apart from the occasional stunted tree and a few drifts of pale green bracken much of this part of the heath appeared featureless and barren. 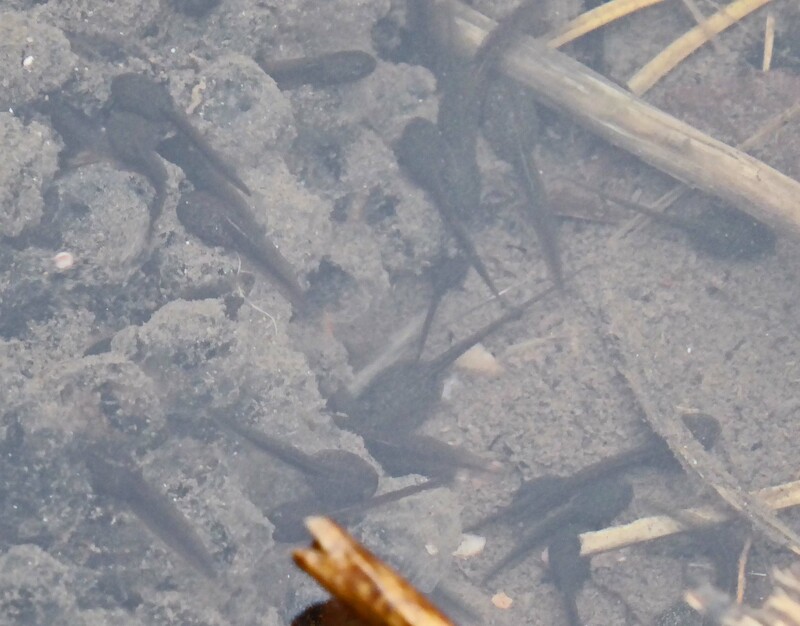 Closer inspection, however, revealed some of the heath’s special wildlife. Near the path edge, the cheerful purples, pinks and violets of the three common species of heather showed well. These heathers flourish across the heath alongside rough grasses and gorse, and their bright pastel-coloured flowers lend a purple-pink tinge to long views at this time of year, the colour augmented by sunshine but lost in a mass of dull browns and greens when cloud covers. 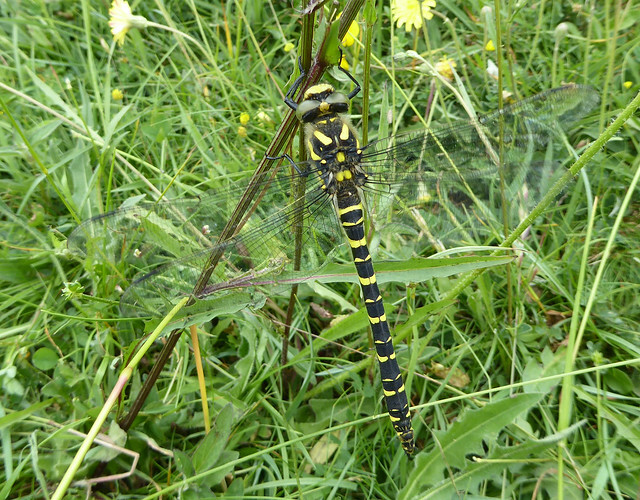 Large, metallic blue and green emperor dragon flies, the size of small birds, were attracted to the ponds scattered across the heath. They swept back and forth across the water making repeated, aerial, hairpin turns in a constant search for insect food. Heather spikes dipped momentarily when yellow-striped bumblebees moved among the flower-bells collecting pollen and nectar. The sandy path levelled out. Heathland now spread extensively on both sides and, together with the grey cloud cover, created a claustrophobic feeling. Ahead of me was a band of trees with a gate and standing water. The trees mark a drainage ditch feeding into the Tadnoll Brook, a chalk-stream tributary of the River Frome. I crossed the ditch on a very solid brick bridge, and was transported to a different world, one of damp meadows and thick rushy grass. The wet meadow, soggy underfoot, was dominated by untidy stands of shoulder-high marsh thistles with multiple, prolific, spiny stems. Each stem was topped by a starburst of flower heads, a mixture of shaggy purple flowers and brown and white fluffy seed heads. Between the thistles, the lemon-yellow cushion flowers of bird’s foot trefoil scrambled through the undergrowth and, as I walked, pale brown grasshoppers soared in long arcs from the rough grass, seeking safety away from me. Butterflies danced around the unruly thistle flowers like confetti caught in the breeze, pausing occasionally to take nectar. Small tortoiseshell, marbled white and peacock resembled colourful modernist stained glass and a pair of gatekeepers performed an airborne ballet. 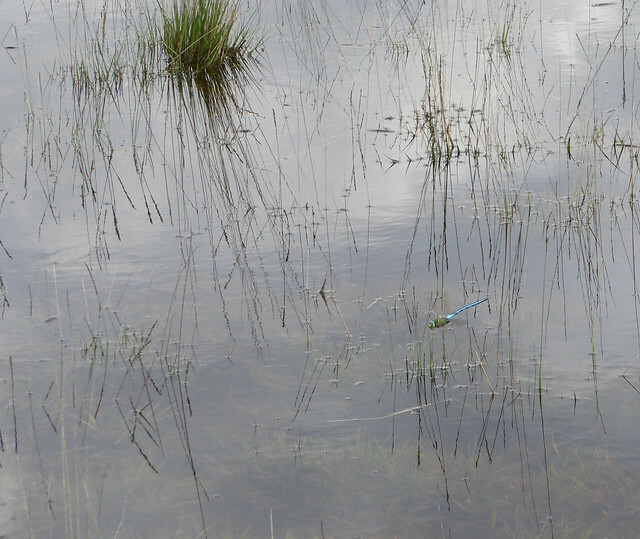 This enclosed wetland felt like a land of plenty, a land of unconstrained, fulsome growth. Even in high summer, however, the meadow was wet and marshy so that after winter rain the area will become boggy and treacherous. A group of cows lurked in a corner of the meadow watching me; they help to control growth of vegetation but create further hazards for the unwary walker. These two very different habitats, the larger lowland heath and the smaller wet meadow make up the majority of the Winfrith reserve as we see it today but the area hasn’t always looked like this. Until the Bronze Age, this land was covered with forest (birch, pine, hazel, elm, oak) but 3-4000 years ago trees began to be felled exposing the underlying soil. 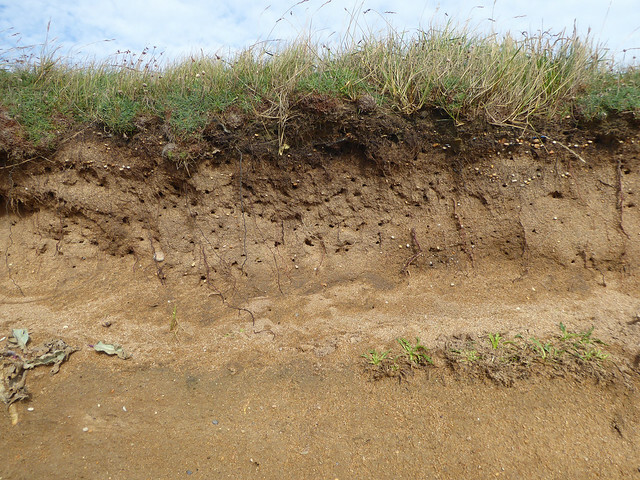 Nutrients were gradually washed away from freely draining soils leaving behind a relatively acidic surface where heathers and gorse flourished, eventually creating the heath we see today. This landscape was maintained and scrub encroachment prevented through a combination of grazing by cattle and ponies and by heathland practices such as furze, turf and peat cutting. Heathland once stretched from Dorchester in the west to the Avon Valley in the east but much has been lost following changes in agricultural practices or through building; a large part of Winfrith Heath was swallowed up when the nuclear research facility was built in the 1950s and still lies behind forbidding fences. Today, only 15% of the original heath is left but what remains is a very important and rare landscape and part of Dorset’s history. 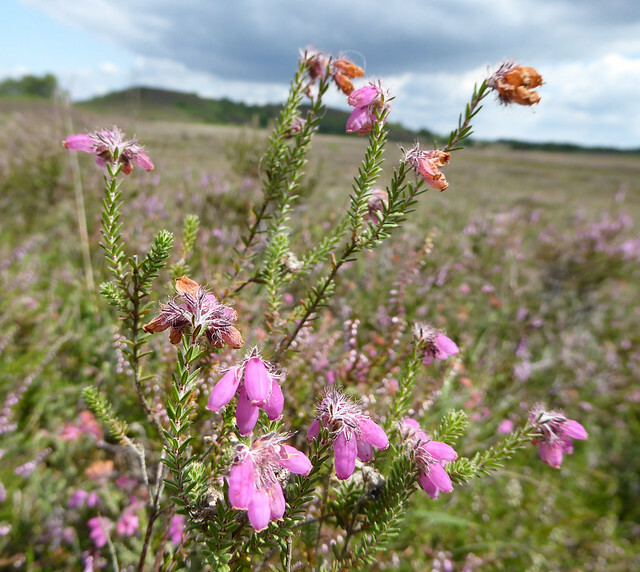 Its importance as a special habitat supporting rare species such as the Dartford warbler and the nightjar is recognised by its designation as a Site of Special Scientific Interest but the heathland is still threatened directly or indirectly by development. But did I get any sense of what Hardy’s Egdon Heath was like from my visit? Even on a small area like Winfrith, there was a definite sense of isolation in the central part of the heath, and that feeling was only partially lifted when the sun shone and the heath took on some colour. So, if it’s solitude you are after, then it’s a perfect place. One person’s solitude is, however, another person’s loneliness and it’s not difficult to see how Egdon might have depressed some of Hardy’s characters. Neither is the heath a benign environment; care is required in all seasons but in winter, it is bleak, brown and very windy with boggy areas dangerous especially after wet weather. Having said all that, the heath does have an undeniable grandeur but its very rarity as a landscape nowadays means that we may not know how to react to it. Perhaps like Hardy’s “survivors” we should simply accept and embrace the heath for what it is, foibles and all. Winfrith Heath lies to the west of Gatemore Road in Winfrith Newburgh and a Dorset Wildlife Trust information board marks the entrance. 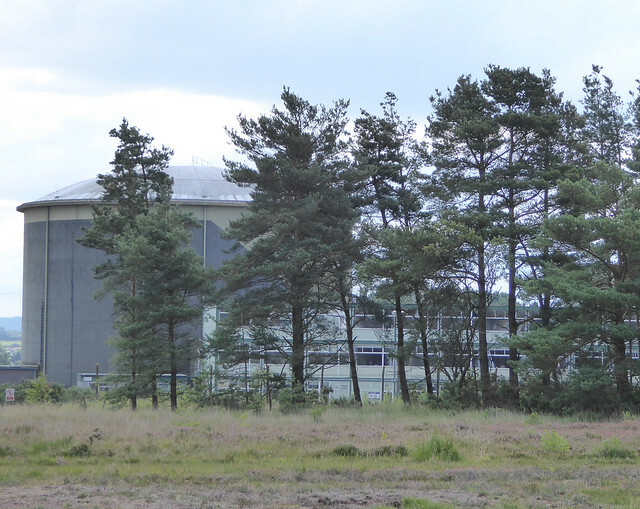 The former nuclear research facility seen through trees and behind forbidding fences on the other side of Gatemore Road. 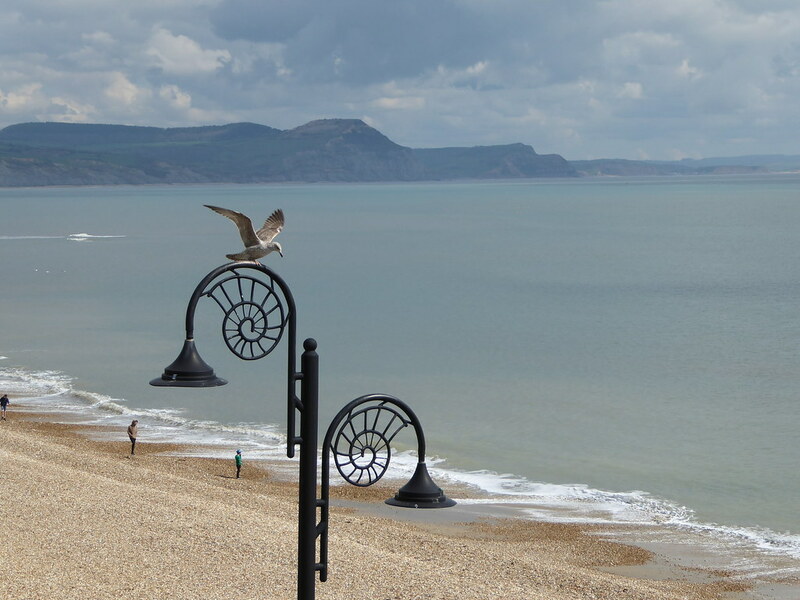 Mature trees, richly planted borders, gently curving paths, a place to look and a space to think – the Seafront Gardens in Lyme Regis provide both an oasis of calm for humans and a safe haven for wildlife. Not only that, some of the town’s best views may be savoured from this green space. Looking ahead, the Cobb can be seen stretching its protective, rocky arm around the harbour whereas, across Lyme Bay, the west Dorset coast rises and falls like a gigantic wave sweeping eastwards over Stonebarrow and Golden Cap reaching, on a clear day, that louring sea monster that is the Isle of Portland. 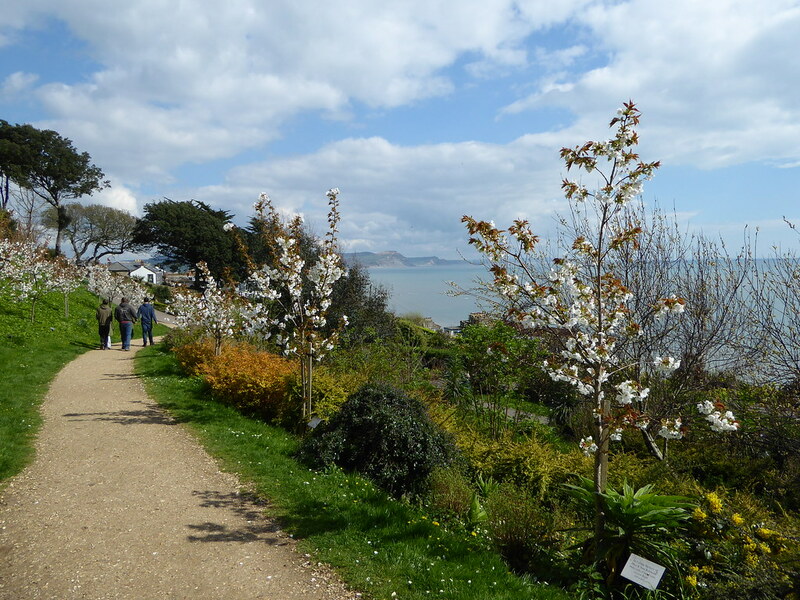 Just over a century ago, the Langmoor Gardens were opened to the public on the slopes above Marine Parade in Lyme Regis. The land was bought through a bequest to the town from Joseph Moly of Langmoor Manor, Charmouth and the gardens were named in honour of the donation. The slopes were known to be unstable and concrete buttresses had been built to prevent movement. Despite this, there were periodic slippages of mud on to Marine Parade and throughout the 20th century the Gardens continued to move causing distortion to paths and eventually rendering the lower part of the gardens unusable. In 1962, land to the west of these gardens suffered a catastrophic landslip following a misguided attempt at development and several houses were destroyed. This land was eventually taken over by the town becoming the Lister Gardens, named after Lord Lister of Lyme Regis, pioneer of antiseptic surgery. The Langmoor and Lister Gardens now form one large continuous public space above Marine Parade. 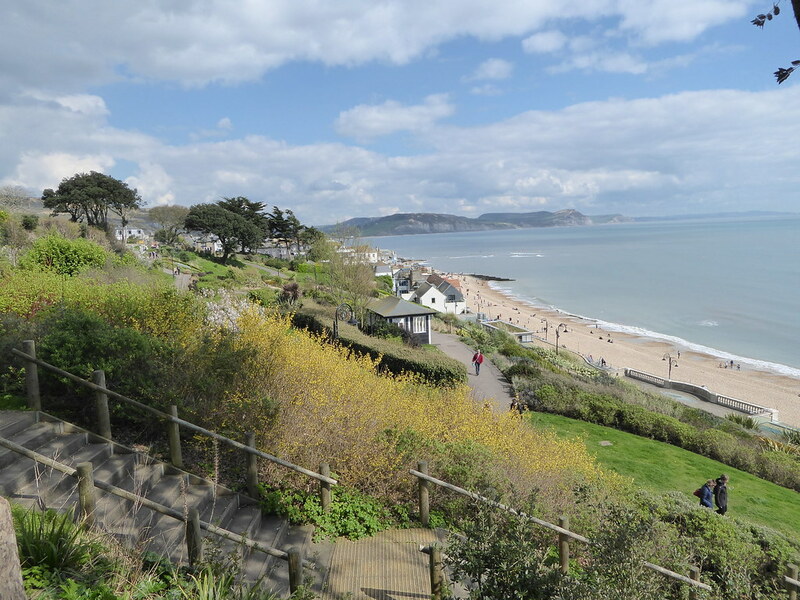 The Lyme Regis Environmental Improvements carried out early in the 21st century provided an opportunity to deal with the unstable geology of the Gardens. Between 2005 and 2007, major civil engineering works were carried out to stabilise the Langmoor and Lister Gardens which were completely remodelled. The new design included many planted areas and grassy spaces, gently curving paths that seem to reflect the convexity of the Cobb, and a woodland boardwalk with outstanding views across the harbour and bay. Facilities for mini-golf, putting and table tennis were also built. Supporting wildlife was deemed important so before work started, bat nesting sites were sealed to prevent them returning, 2000 slow-worms were caught and rehoused and a 15cm barrier erected to prevent others entering. The gardens were replanted with salt tolerant, sub-tropical and rare plants as well as native species, taking account of the needs of bats, birds and insects. Now, a decade later, the Gardens have a mature look and nesting boxes for birds and bats are flourishing. Visitors love the open space and the new design was recognised with an important national award. Mid-winter is typically a low time when weather is poor, plants are dormant and wildlife scarce but when I visited the Gardens in December and January I found surprising activity. Flowering cherry trees at the rear of the Gardens were covered in frothy pink flowers and close by, two fragrant shrubs were also showing well: winter honeysuckle with its white trumpet flowers filled with yellow-tipped stamens; sweet box, covered with tiny white starburst flowers, dark green fleshy leaves and shiny black berries. As I was admiring the flowers, several bumblebees flew past, stopping briefly to feed from the cherry blossom. On the terraced borders above Marine Parade, extensive banks of rosemary were covered in mauvish-purple flowers. These were proving very popular with bumblebees and even in mid-winter, I saw queens and workers foraging busily, collecting sugary nectar and protein-rich pollen from the flowers. 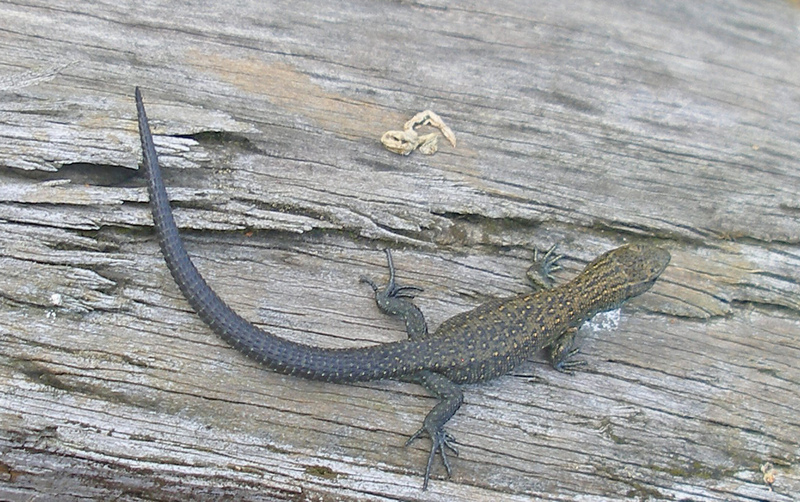 The queens were large and furry with two prominent buff/yellow stripes and a grey or pale brown tail, the workers similar but smaller and more brightly coloured. These are buff-tailed bumblebees and their relationship with the flowers is far from one-sided. The flowers consist of two petals enclosing pollen-loaded anthers that beckon seductively at passing insects. The lower petals contain darker markings highly visible to bees helping to draw them in. 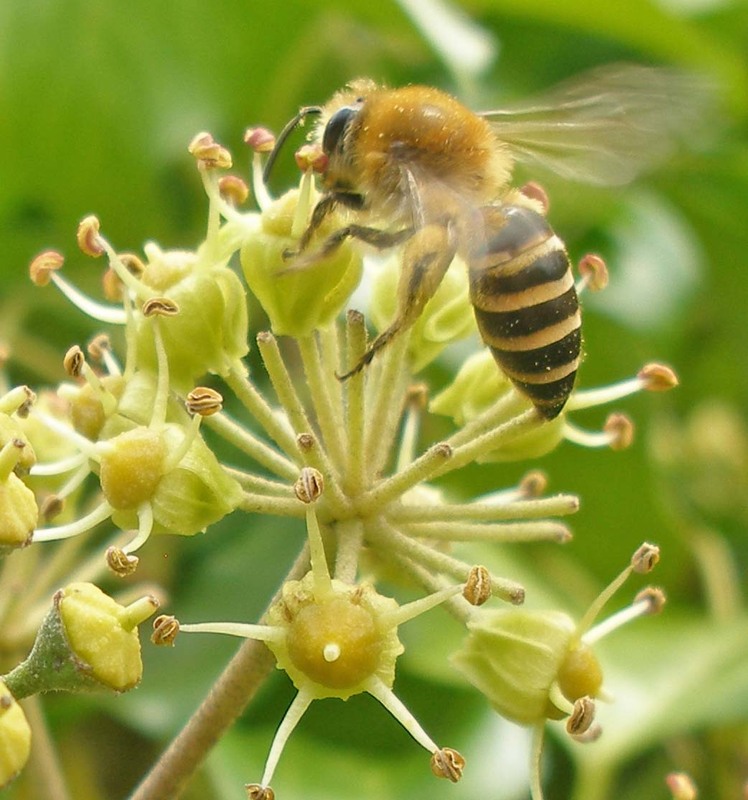 Each bee that feeds collects additionally a dusting of pollen from the overhanging anthers which they transfer to the next flower they visit ensuring cross fertilisation. But shouldn’t bumblebees be hibernating at this time of year? That’s what all the books say, but the presence of worker bumblebees collecting pollen suggests that somewhere in the Gardens or nearby there are active nests. 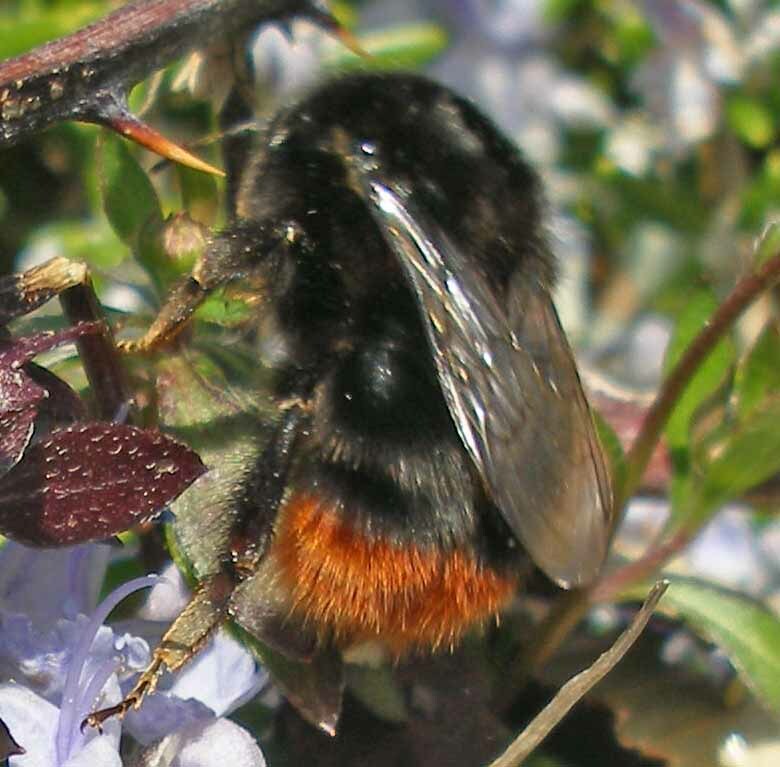 Winter active colonies of buff-tailed bumblebees have also been described in South Devon and in Cornwall as well as other locations in the southern half of the UK. It isn’t clear why this is happening but perhaps these bees are taking advantage of the British penchant for planting winter-flowering plants and shrubs. 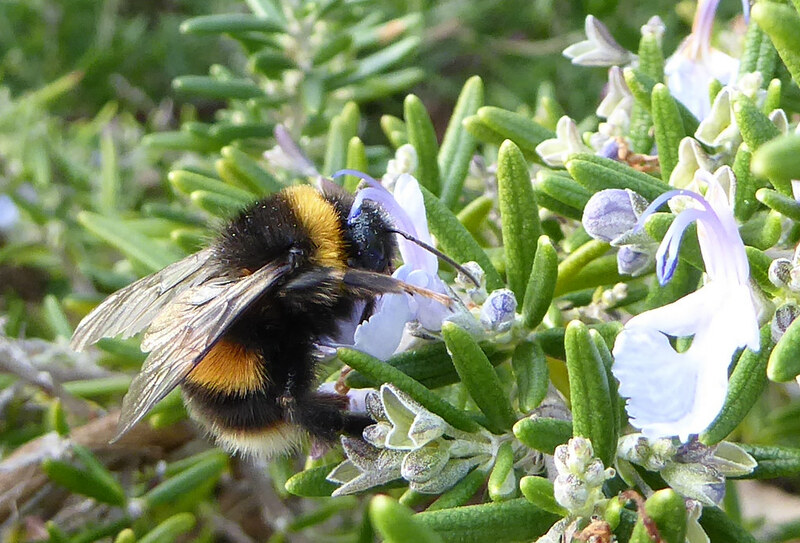 The Langmoor and Lister Gardens with their huge banks of flowering rosemary provide this winter forage for the west Dorset bumblebees. Support your local bumblebees and they will support you. Although buff-tailed bumblebees seem to be doing well in west Dorset, many other species of bumblebee in the UK have declined over the past 50 years. 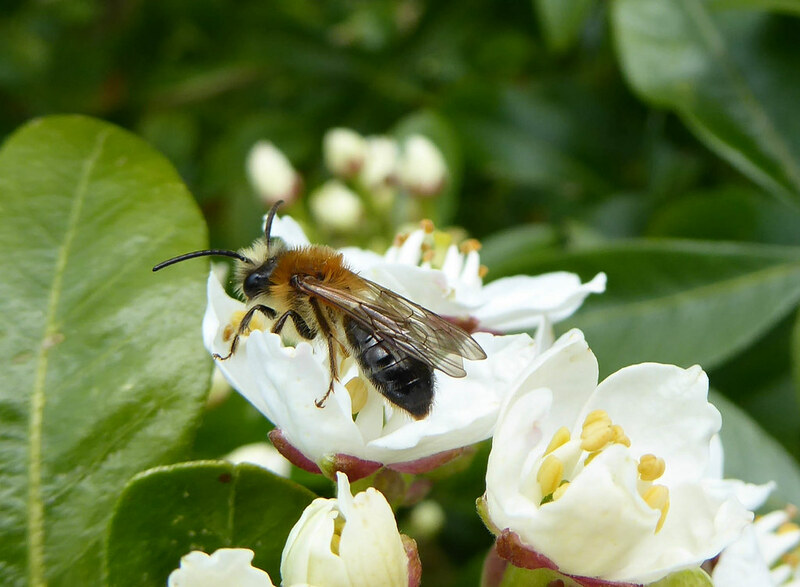 This is bad news because these insects are important pollinators of fruit trees, vegetables and flowers. The decline is largely a result of the agricultural intensification that has changed the look of our countryside leading to the loss of bee habitat, loss of wild flower forage and the use of pesticides. We can’t reverse this intensification, but we can all help bumblebees by planting flowers in our gardens and by never using insecticides. 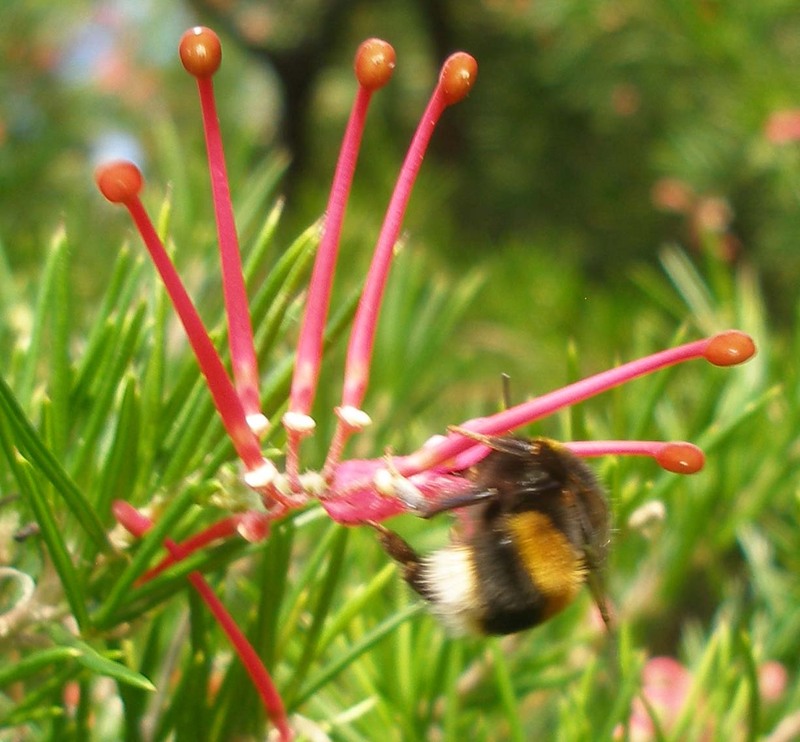 It’s important to choose a range of flowers that provide food for bees throughout the season: the University of Sussex has a useful guide to bee-friendly flowers. If we provide flowers, the bumblebees and other kinds of bee will return the compliment, visiting our gardens, pollinating our fruits and vegetables and improving their quantity and quality. When I returned to the Gardens in early April, I found the rosemary still flowering profusely, showing what an important source of insect food it is. 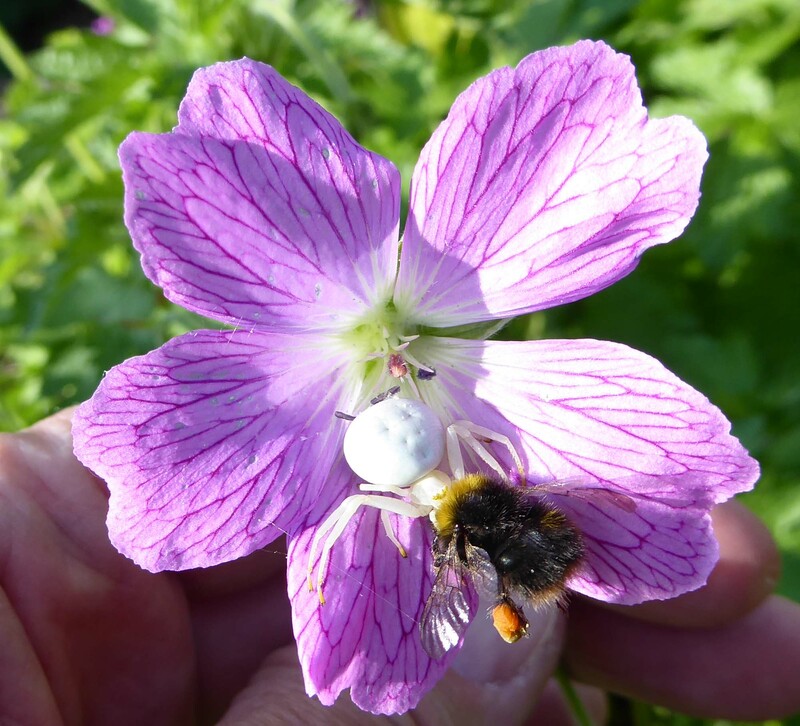 Other plants were also starting to contribute to the forage, and spring insect species were emerging such as the beautiful early bumblebee and red-tailed bumblebee and the grey-patched mining bee. 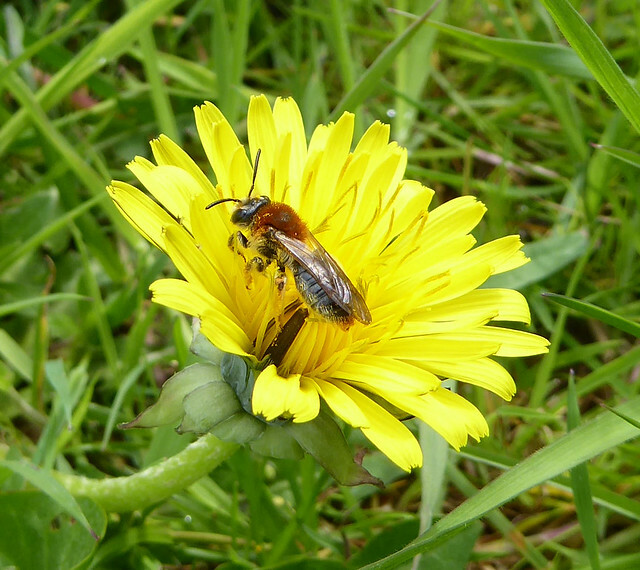 Grey-patched mining bee (Andrena nitida) photographed on April 2nd 2017 in the seafront gardens. This article appeared in the May 2017 edition of the Marshwood Vale Magazine. Runny nose, sore throat, hacking cough? Do you run to the pharmacy for a cough medicine that may or may not help? Until 2006, in the market town of Bridport in the south west of the UK, the locals had the luxury of a cough medicine that really seemed to work. 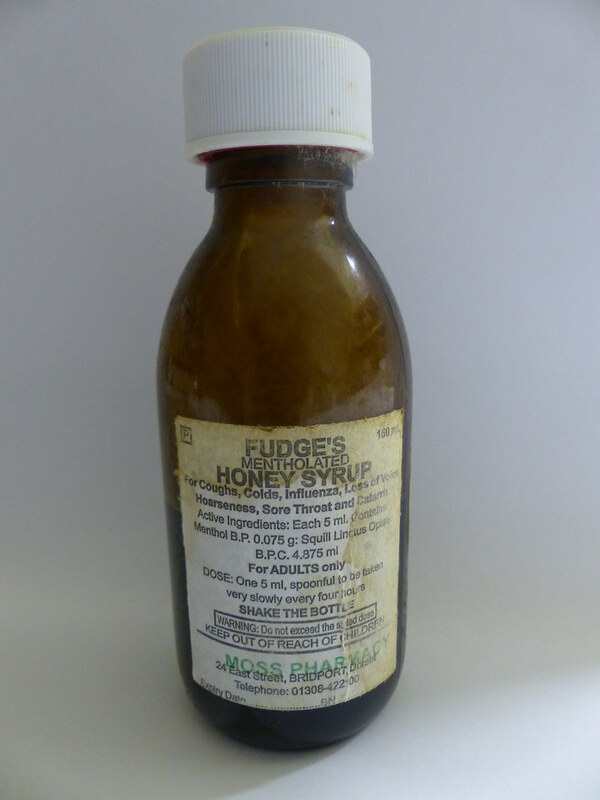 The medicine was Fudge’s Mentholated Honey Syrup, or as the locals christened it, Fudge’s Firewater. Here is the story of this potent potion, how it came about and why it is no longer available. 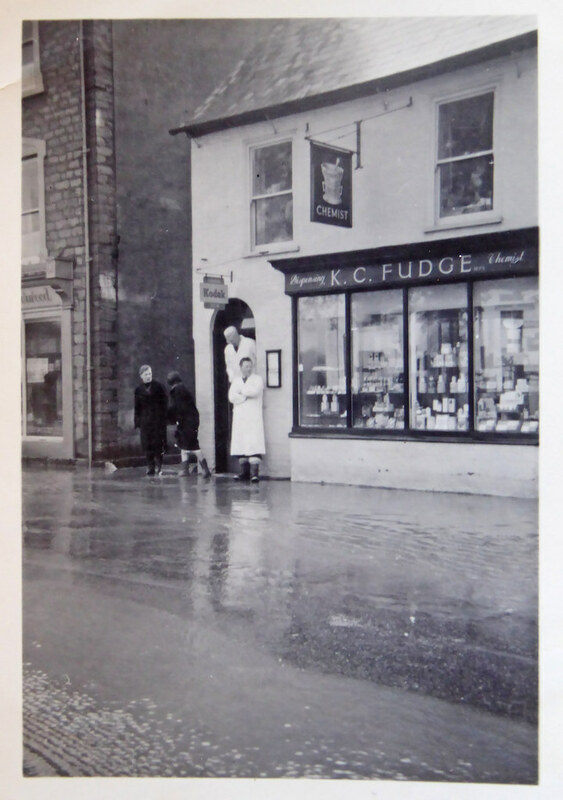 Mr Fudge’s Pharmacy in the late 1950s when the road was flooded. Mr Fudge is seen standing in the shop doorway with Donald Balson from the next door butchers shop in front. Photo kindly supplied by Richard Balson. The story begins in the 1950s when Ken Fudge moved from London to Bridport to open his pharmacy in West Allington, next door to Balsons, Britain’s oldest family butchers (est. 1515). For Mr Fudge, trained in London but born in Blandford, this was something of a return to his roots. 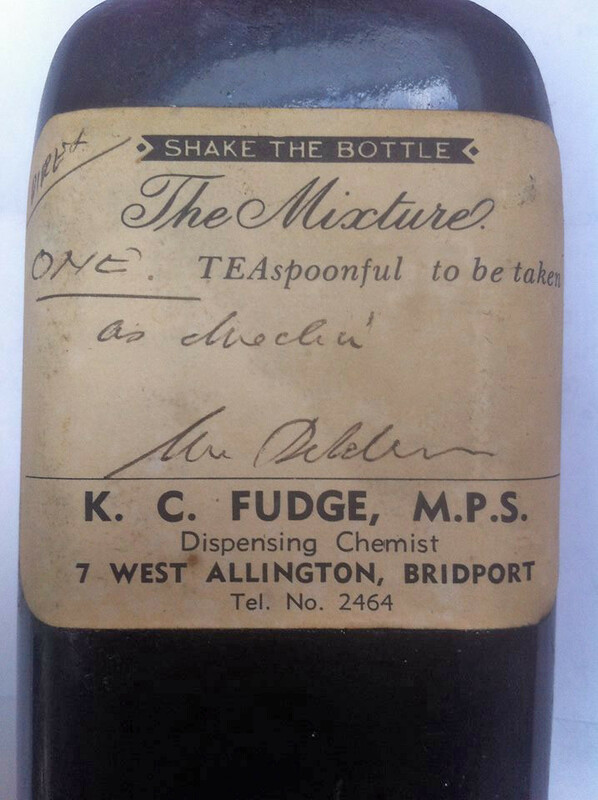 At that time, many pharmacists devised their own remedies, often to secret recipes, and Mr Fudge was no exception. He made several nostrums, as these remedies produced and sold in a single pharmacy are called, but the most popular and enduring was his Mentholated Honey Syrup (known locally as Fudge’s Firewater). When Mr Fudge retired in 1973, the recipe transferred to the East Street Pharmacy where it was sold until 2006, for much of that time under the supervision of Mr Kevin Morrish. Even now, the mere mention of the Fudge’s name evokes a warm wave of nostalgia and longing in many Bridport people. Fudge’s Firewater was an old-style cough medicine recommended for common winter ailments: coughs, colds, influenza, loss of voice, hoarseness, sore throat and catarrh. The dose was one teaspoon every four hours and the label warned ominously that each spoonful should be “taken very slowly”. It was sold “over the counter” without prescription but strictly under the control of the pharmacist. Fudge’s Firewater was immensely popular and many people have told me how much they trusted it to help their symptoms: “Brilliant cough mixture, couldn’t beat it”, “Amazing medicine for coughs and sore throats”, “Never bought anything else”, “Please, if there is a god, bring back Fudge’s Firewater”. People travelled long distances to purchase the medicine, holiday makers often went home with supplies and, during some winters, as many as 250 bottles of Firewater were sold each week at the East Street Pharmacy. The medicine also had a formidable reputation: “It nearly blew your head off but by golly it did the trick”, “Tasted like red diesel mixed with the finest brandy, lovely”, “The menthol really took your breath away” “It was a trial to take but you knew it would make you better” and several people spoke of “the Fudge’s shudder”. As Mr Fudge himself said: “Some do swear by it, some do swear at it”. The medicine was also a voice-saver for some professional singers and I heard about one well-known entertainer who would regularly send a friend to buy Firewater from Mr Morrish to help lubricate her vocal cords. Similarly, Marco Rossi told me that, in the 1990s, when he was part of local band, Stocky Lamaar, performing in smoke-filled pubs around Dorset, he and Al, the other vocalist, each had a bottle of the potion by them on stage. With the occasional swig of Firewater, they could sing all evening without sounding like “Madge from Neighbours at a Bonnie Tyler tribute karaoke night”. What was Fudge’s Firewater and how did it work? Mr Fudge’s medicine was a dark brown syrupy liquid made by mixing menthol crystals and a little fudgy flavouring into Gee’s Linctus, itself an old-fashioned cough remedy dating from the Victorian era. 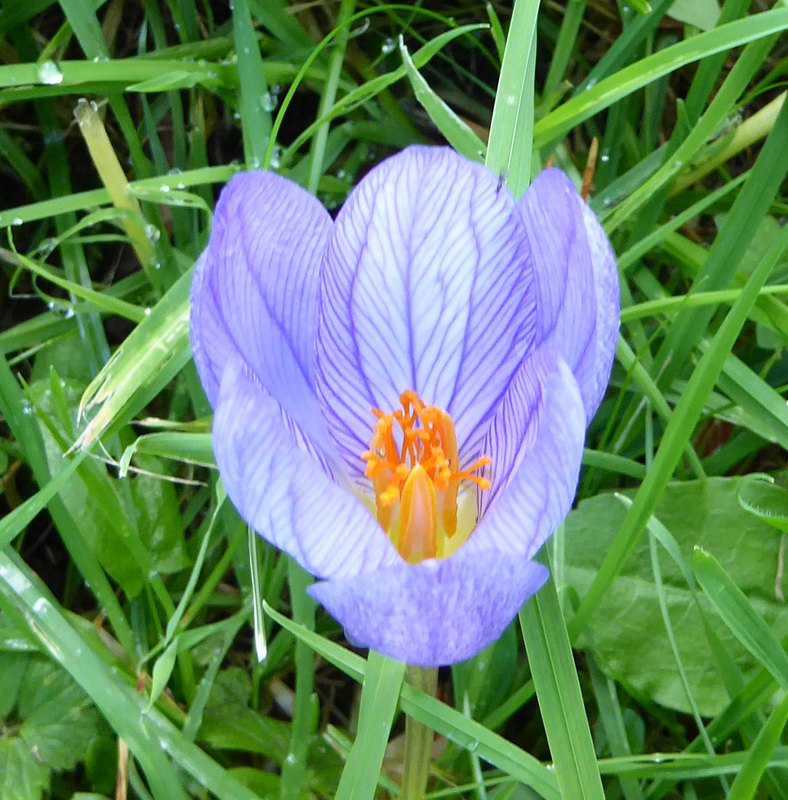 Gee’s linctus, or to give it its proper name, squill linctus opiate, contains several potentially active ingredients. First, there is tincture of opium, an alcoholic extract of opium (the resin derived from the seed capsules of opium poppies). The main active ingredient in opium is morphine, a substance with an established effect on cough, but also a well-known drug of abuse, and the linctus contains morphine at low levels. Squill, a plant extract, is another potentially active component in the linctus that, paradoxically, encourages coughing and mucus removal. The medicine also contains alcohol at similar levels to a fortified wine and this may have contributed to the Firewater experience. Mr Fudge’s masterstroke was to boost the effects of the Gee’s linctus by adding menthol, a remedy used for many years to help with symptoms of coughs and colds; menthol may also act as an oral anaesthetic helping with sore throats and may relieve nasal congestion. Although cough medicines cannot alter the course of viral infections, they may help you feel better and Mr Fudge’s medicine attacked symptoms in several ways which is perhaps why it was so popular and so successful. It was the menthol, however, that made the potion so memorable, justifying the Firewater nickname and establishing a shared experience among those who used it, believed in it and benefitted from it. Non-prescription medicines such as Gee’s linctus, and Fudge’s Firewater, have been abused by people trying to access even the small amounts of morphine they contain. Gee’s linctus is, for example, reported to induce a “lovely euphoria and dreaminess”, but only if you are prepared to drink 50ml or more of the medicine! Local pharmacists were aware of the problem and tried to control it: Mr Morrish monitored all sales personally and Mr Conroy (manager in the early 21st century) restricted sales to one bottle per person, with a signature. Gee’s linctus gradually fell out of favour as a cough medicine because of the problem of abuse. Finding commercial sources of the linctus became more difficult and temporary interruptions to the availability of Fudge’s Firewater occurred early in the 21st century. Then, in January 2006, a notice appeared on the window of Bridport’s East Street Pharmacy (then owned by Moss/Alliance) announcing that the medicine would be discontinued owing to “problems with the supply of ingredients”. That was the official line but I suspect this was not the full story. Around this time there had also been a change in the pharmacy regulations. Nostrums containing even small amounts of morphine, like Fudge’s Firewater, now required a prescription and this change must have contributed to Moss’s decision. That wasn’t quite the end, though, because a modified Firewater was available for a few years from the St John’s Pharmacy in Weymouth, about 20 miles south east of Bridport. A Weymouth pharmacist, Mr Dipan Shah, produced and sold a version of the potion but because of the change in pharmacy regulations, people needed to persuade their doctor to issue a private prescription if they wanted the medicine. The need for a prescription severely affected sales and by 2009 production finally ceased. The change in regulations also means that Fudge’s Firewater is very unlikely ever to reappear. Fudge’s Firewater served Bridport well for 50 years. The medicine is now just a memory but one that should be preserved as an important part of Bridport’s history. I should like to thank Angela Alexander, Stuart Anderson, Richard Balson, David Conroy, Richard Cooper, Margery Hookings, Diana Leake, Kevin Morrish, Caroline Morrish-Banham, Dipan Shah, Elizabeth Williamson, Joy Wingfield, The Bridport Museum and the many commenters on social media who generously helped me in preparing this article. This article appeared in a slightly modified form in the March edition of the Marshwood Vale Magazine. The picture at the top of this post shows Mr David Conroy, manager of the East Street Pharmacy in Bridport in the early 21st century (from the Bridport News). 2006-2009 Firewater available in Weymouth (Mr Dipan Shah, St John’s Pharmacy) but only with private prescription. The first page of my article on solitary bees in the July/August edition of Resurgence and Ecologist Magazine showing a male hairy-footed flower bee. 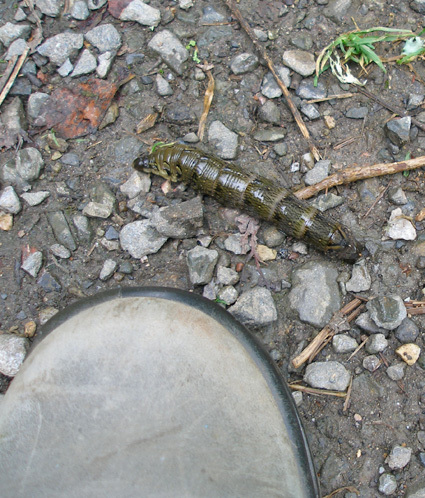 An Elephant Hawk Moth caterpillar, seen in Staverton, Devon, September 2014. Photo by Hazel Strange. The shoe is there for size comparison. 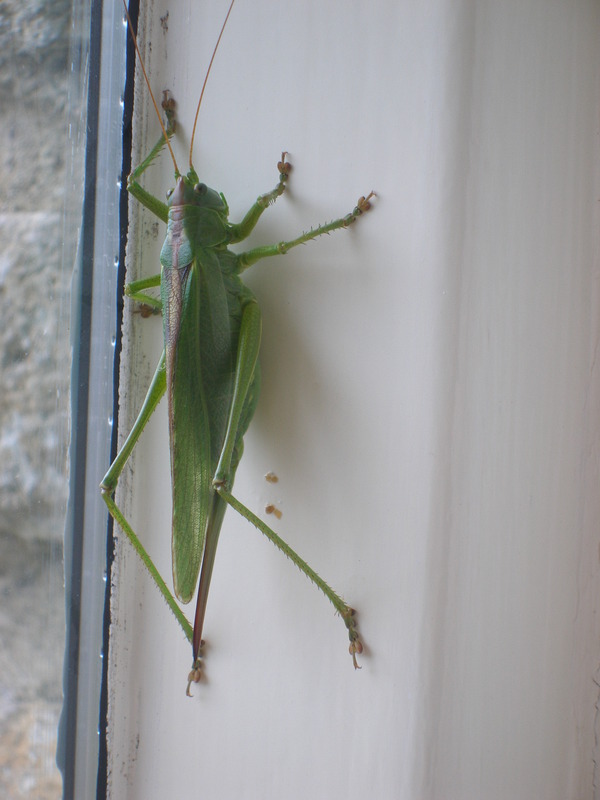 We saw this Great Green Bush Cricket in August 2014 in Dorset. It is at least 4cm long! Saw this plant growing in cracks between the stones on the Cobb at Lyme Regis in Dorset. 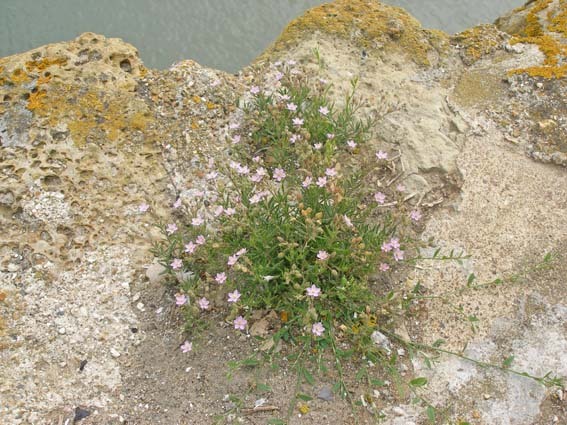 I think it is Rock Sea-Spurrey. The photograph was taken by Hazel Strange (August 2014).